Dainty has been absent, but I have a good .. strike that .. I have a great excuse. I’ve moved. Not far. Just a mile or so down the road. But even if the distance was 10 feet, it’s still a huge process. Packing, unpacking. Oh, and buying the place. And dealing with a construction crew that is – even a month after moving – still on site. But they are good boys so I don’t mind them being around. Yes, the builders are still here. And yes, this building is new construction. It’s an unusual building, too. The design is based on the Powerhaus design used quite a bit in Germany and apparently this is the first building of its sort in the U.S.
And what makes it so unusual? It’s incredibly energy efficient. Like, super super efficient. I’ll get into it in more detail eventually, but let’s first talk about how it impacts Dainty the most: In the kitchen. I’ve cooked with gas stoves since I learned to cook. But, the question in this Powerhaus design is this: Is gas efficient? No. Apparently gas is upwards of 70% less efficient than electricity. Bleh. I hate electric stoves. I mean, fire is so fierce, you know? Fire is awesome. But, fire fails in efficiency. So … Dainty now has an electric cooktop. To be more specific, it’s an Electrolux Radiant/Induction Cooktop. It has two radiant burners and two induction burners on its flat surface. What’s induction? You know that commercial with Kelly Ripa making a meal and her water boils in 90 seconds? That’s induction. It’s a little like magic. But water boiling in 90 seconds? Awesome. After about a week of avoiding all forms of cooking once we moved in, I decided to cook something on the induction burner. Or at least boil something. Can’t go wrong with boiling, right? I boiled eggs. It’s a simple enough process: Eggs in pot, cover with an inch or so of water. Bring to a boil. Cover. Turn off heat. Let them sit for 12-15 minutes. Rinse with cold water to bring down temp. I did exactly as outlined. And I got a soft-boiled egg. Here’s where I went wrong: When cooking on a radiant, coiled or gas burner, it takes time for the water to come to a boil. During that time—what? maybe 5-6 or so minutes?—those eggs are slowly cooking. When using induction, that time to boil is cut drastically short and hence the cooking time is cut short. 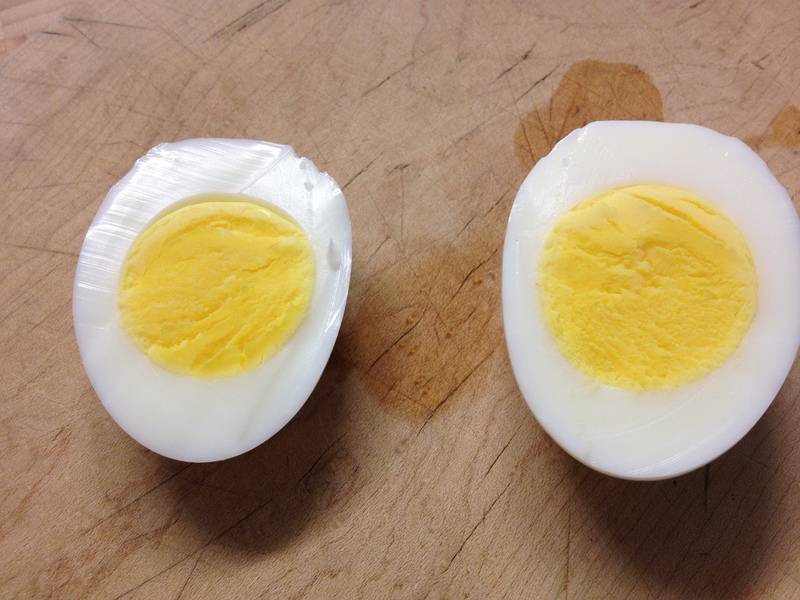 Ergo, soft-boiled eggs. Eggs boiled on induction cooktop at a 1.5 minute full boil. I’ve gotten back up on the cooktop and tried boiling eggs again. One minute at a full boil is not enough. 90 seconds, not enough. Two full minutes, a tad too much. Plus, without a slowly firming inside the shell, the shells tend to crack when they come to a rolling boil so quickly, spilling their whites. Using the radiant burner. Thank goodness it’s a hybrid. If you’re not an egg lover or have not gone out to for brunch in 15 years and aren’t familiar with a frittata, it’s the Italian take on the classic French omelette: Beaten eggs in a hot skillet, but with the fixins in them and presented flat, not folded. And finished off in the oven. Served in slices. Come to think of it, it’s like a slice of egg cake. Filled with sausage or salmon, chicken or chopped tomatoes, their many formulations stuff recipe sites and cookbooks. I’m telling you now, throw out the recipes and create your own on auto-pilot. It’s as easy as opening your refrigerator. We’ve been members of a gay ski house up in Vermont for going on eight years now. On any given fall or winter weekend, the house is filled with boys from NYC and Boston, boyfriends flying in from elsewhere and occasionally a few girls. There can be up to 12 or 14 folks sitting around the dinner table. The New York boys have a reputation for preparing over-the-tops meals – usually creatively fueled with several apre-ski cocktails. Caviar shows up on the menu several times a ski season. At least one breakfast each weekend is something I’ve dubbed a “fridge-tata.” While I can take credit for the name, I can’t take credit for the process. That would go to the likes of Hal and Steve. They stare into the open fridge, assess the leftovers, and pull out the fridge-tata’s fillings. Chicken and green beans? Tuna and asparagus? As long as they have six or more eggs and that huge skillet (it must be 16 inches), they can create a breakfast fortified enough to fuel a day of downhill. On Sunday, I created my own single-serving fridge-tata for a post-snowshoeing snack. -Using a small, 8-in. skillet set on medium, I heated up the rice and beans. Meanwhile, I whisked up my eggs with salt and pepper. 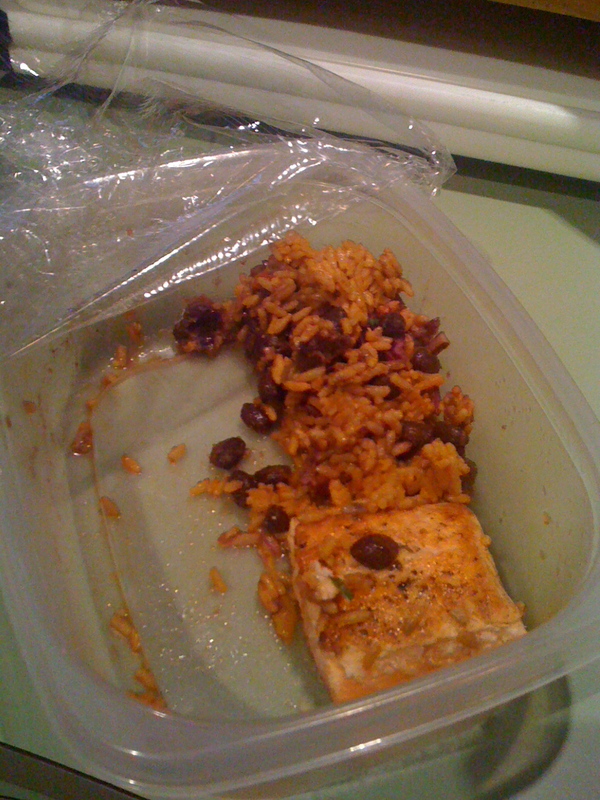 -After beans and rice formed a bit of a crust on the bottom, I broke it up a bit and added my little hunk of leftover salmon. I waited because I didn’t want the salmon to be cooked to much more than it already had been. -With the salmon in there for about 30 seconds, I added the eggs and turned the heat down to medium low. 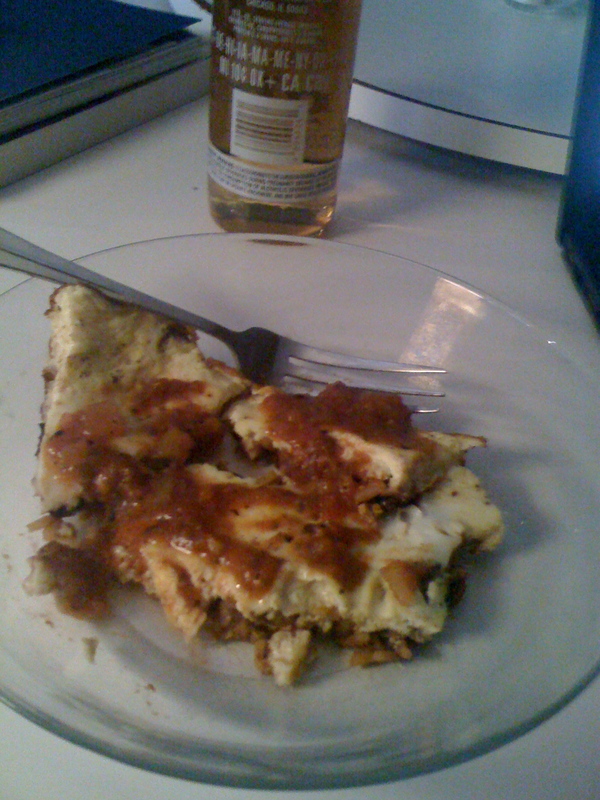 -I let the eggs set a bit – enough so that I could lift the sides with a spatula. This took only two to three minutes. -The top of the fridge-tata needed to set, so I put a lid over the skillet for a minute or two. I could have used another egg or two to make the fridge-tata thicker. But then it would have been too much for me to finish. Had I cooked a more massive fridge-tata in that larger 16-in. 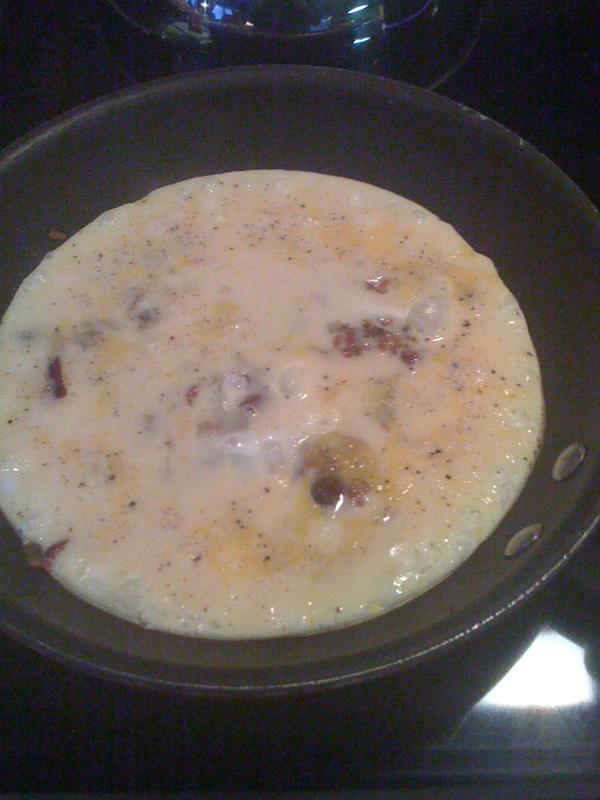 skillet, I would have used way more eggs – probably eight or more. And, I would have cooked it on the stovetop until the eggs set up, covered it and set it on medium low for maybe 14-15 minutes, and then put it under the broiler for a minute or two to make sure the top was crisp. It’s not the gourmety-est dish. But it’s the perfect way to deal with leftovers when roughing it in a ski house. You are currently browsing entries tagged with eggs at The Dainty Dot.